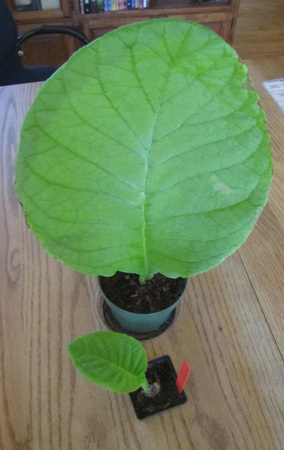 In June 2008, I went to visit Fred Stryker, a friend and fellow gesneriad grower, and took along my Sinningia defoliata, with one very large leaf, to show him. On the way home, the plant rode in the hatchback area. I had neglected to notice that since I was travelling north, the plant would be exposed to full sun through the rear window. Obviously, this leaf was a goner. I cut it off and hoped the plant would make a new leaf. But not all the leaf was destroyed. I trimmed off the 90% that was damaged, and planted the rest, with some stem attached, in a propagation box. Unfortunately the base soon rotted. Still unwilling to give up, I trimmed off the rotted portion, and then treated the remainder, which was now only leaf (no stem portion left) like an African violet leaf, cutting away leaf blade to create a leafstalk-like portion, and planted that pseudo-stalk in the mix. It took a quite while, but this time, the cutting rooted. Below is a picture of the same leaf cutting at the end of November 2008. It had now formed the beginnings of a tuber, with two lobes. The protrusion from the midrib below the trimmed leaf blade is the stub of a leaf rib, not another shoot or leaf as seen on the main defoliata page. Meanwhile, the tuber was putting out three new leaves. They almost exploded from the tuber, they were growing so fast. 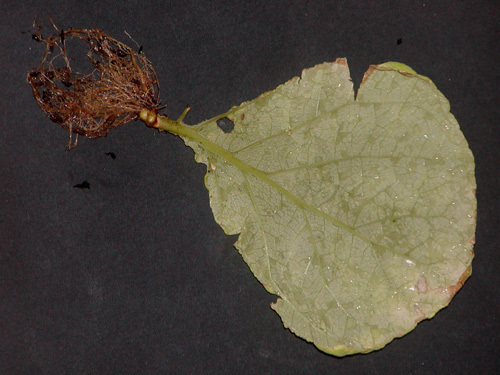 The picture below shows the plant in mid-August, less than two months after losing its only leaf. 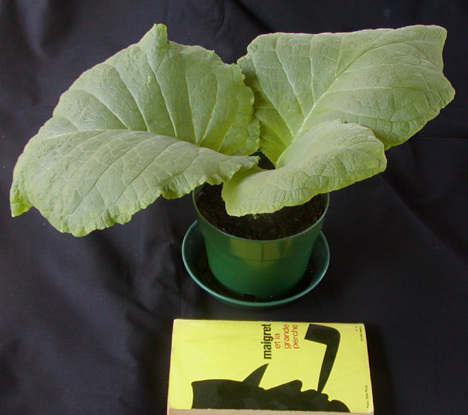 The pot is 5 inches in diameter; a paperback novel is also shown for scale. The plant had gotten too big for the light stand, so I put it outdoors. Even in a partially sheltered location, its inexperienced leaves were unprepared to withstand the wind they were exposed to. Before they could toughen sufficiently, one of them was snapped off. Far from being a misfortune, this was another opportunity to try propagation. This time the (stem + leaf) cutting rooted. Below is a picture of this one at the end of November 2008. The tuber is several times the size of that on the leaf cutting. Both cuttings were rooted completely enclosed in my propagation box, which is a clear plastic container (courtesy of Gene Sussli, who buys them at Costco, where they come with free salad inside) with a 5-cm [2-inch] layer of regular potting mix in the bottom. February 2009: Both rooted cuttings are now dormant. They did not bloom. It remains to be seen whether they will come back from dormancy. The original plant was too large to remain under lights any longer, so I put it outdoors. It did not bloom in 2008. I do not know whether that was because of the damage that it took or because of being outdoors. So far the tuber looks healthy. July 2009: The first rooted cutting never emerged from dormancy. I could not find any evidence of a tuber in the pot. However, the second rooted cutting (from the leaf snapped off by the wind) did sprout from the tuber, just last month (June 2009). The main leaf is only about 4 cm [1 1/2 inches] long, but otherwise the plant looks just like a regular S. defoliata. This appears to show that S. defoliata can be propagated from "leaves", as long as the cutting includes a bit of the stem. Sowing seed is still the easiest method of propagation. Even so, "leaf" propagation is a valuable addition to the grower's tool chest. My indoor plant, from a tuber given to me by Bill Price. It grows in front of a kitchen window, which accounts for the vertical orientation of the leaf, which is 40 cm [almost 16 inches] long. Pot diameter 5 inches. A seedling (seed sown February 2009) from plant #1. My outdoor plant, also from a tuber given to me by Bill Price. It is the heat-and-sun-damaged plant described above. The plant derived from the cutting described above, from plant #3. The leaf is 19 cm [7 1/2 inches] long. A seedling (from seed sown in 2007). The leaf is 18 cm [7 inches] long. Note that this plant, unlike #2, has entered its "adult" stage: no conspicuous stem, no paired leaves. Plant #1 above is still doing fine. It was entered in the San Francisco gesneriad show in September 2009. More about this plant below. Plant #2 is also doing fine; see below. Plant #3 was outdoors over the winter, didn't come out of dormancy when #1 did. Concerned, I brought it indoors. Eventually, the tuber sprouted. Back outdoors, it now [July 2010] has three healthy leaves. Plant #4 above never emerged from dormancy in 2010. Tuber is dead. Plant #5 went in the San Francisco chapter's sale in September 2009. Thus the statistics so far are not optimistic. All the cuttings I took either failed to root, or failed to come out of dormancy. Still, I haven't given up. In August 2009, Plant #1 was putting out a second leaf. Since I planned to enter the plant in the show mentioned above, and since the extra leaf interfered with the vertical single-leaf esthetic I was looking for, I removed and rooted the extra leaf. It went dormant in December 2009. Months went by. In April, no sprout. In May, no sprout. In June, the same. I had pretty much given up on it, but when I returned from the Gesneriad Society convention in early July: new growth! The picture to the right [taken late July 2010] shows the mother plant (Plant #1 above) with its "child" [henceforth Plant #6], from that cutting taken in July 2009. 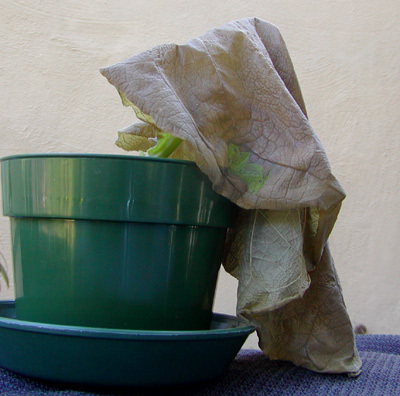 In July 2010, I also took leaf/stem cuttings from Plants #1 and #3. The leaf from #1 went on the San Francisco club's raffle table, and I hope to hear of a success with that one eventually. I put down the leaf from #3 myself. Vegetative propagation by "leaf" cuttings is interesting, just to see whether it works. But do we need it? 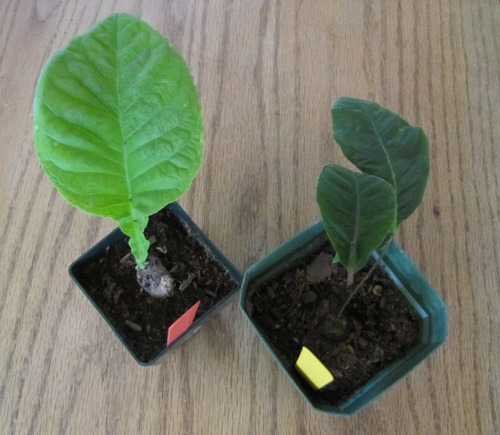 At the left is a picture of two plants, one the cutting-derived Plant #6 (referenced above) and the other a seedling (either Plant #2 or a sibling). The seedling was started a few months earlier. The leaves appear to have about the same surface area, and Plant #6 has a more mature look about it. Still, given the poor track record of cutting-derived plants, one hesitates to be optimistic about that #6. Seedlings have a much better emerging-from-dormancy percentage. It will be interesting to see whether either of these two plants blooms in the coming winter. 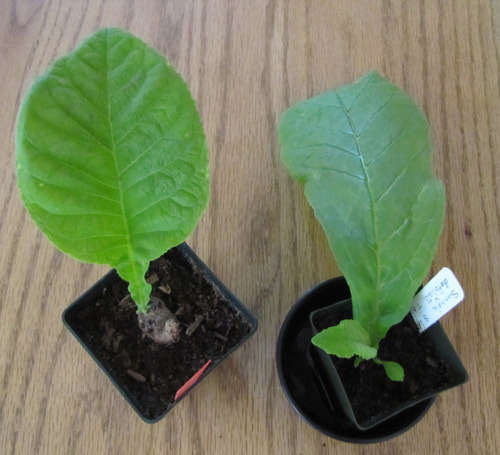 This picture shows two cuttings taken from "stemless" plants about the same time. On the left is good old Plant #6 (Sinningia defoliata). On the right is S. helioana (aka sp. "Santa Teresa"). The plant on the right grew from a cutting taken from a tuber which didn't come out of dormancy in 2010. I don't know whether taking the cutting was responsible for the parent plant's failure to revive in 2010. But at least I have one plant now. If I hadn't taken the cutting, I might have zero. You don't need me to point out the moral of all this, right? In horticulture, just as in science and jobs and real life, so much of learning and success depends on figuring out what to do with the lemon that just came in the door. There's no guarantee the lemonade will taste good. As chronicled above, most of it turned bitter. Even so, there was plenty of experience gained to guide further efforts. And of course, there is the good old answer, valid since the dawn of horticulture: sow seeds!